3 Nemuro – Asahikawa – Tomakomai. 東北 Tōhoku – a ride down Tsunami Highway. 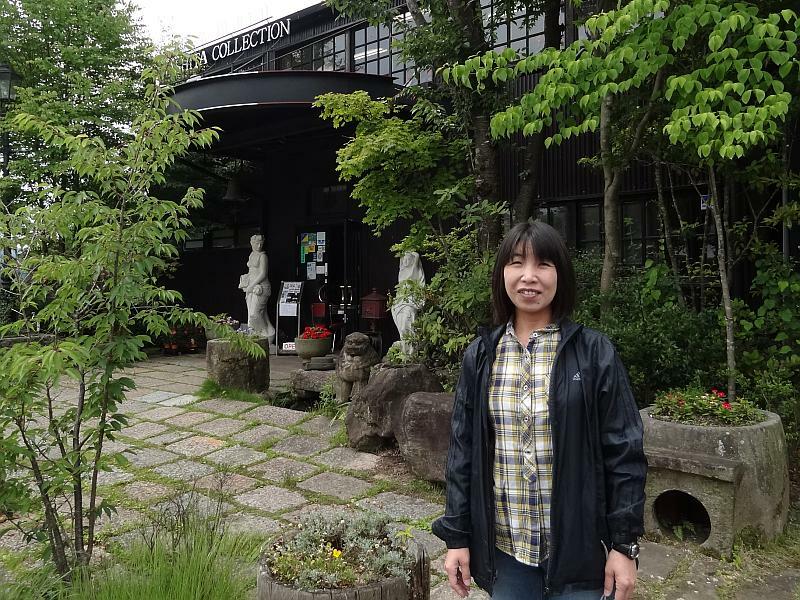 Day One: Hachinohe to Fudai. Day Two: Fudai to Tarō. Day Three: Tarō to Yamada. Day Four: Yamada to Sanriku. Day Five: Sanriku to Ōyakaigan. Day Six: Ōyakaigan to Tsuyama. 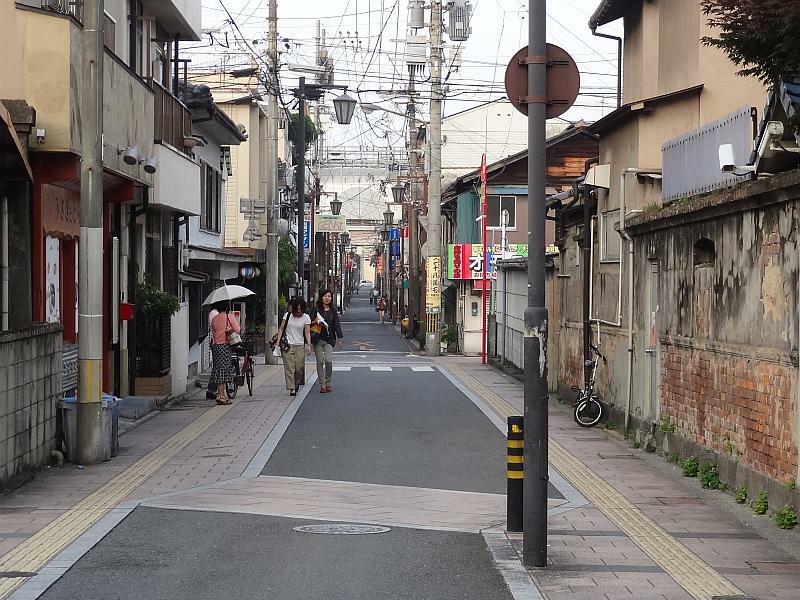 Day Seven: Tsuyama to Sendai. Thursday 31st May 2012 – Kōzakihana to Hario. Not many people at Kōzakihana, in fact I’m the only one. On the way back take a couple of wrong turns but arrive OK and in good time. Owners give me miso soup extra when asked to heat my bento again. Friday 1st June – Hario to Nodake. Departure is delayed by a missing glove. It is not anywhere to be seen so leave without it. Suspect the cat may have taken it last night when interested in my meal, when retreating inside I’m sure I left the gloves outside. Gloves are very important pieces of a cycle tourer’s equipment. Pass the Dutch theme park of Huis ten Bosch on the way, ¥3000 or so admission fee. The buildings are 50% bigger than the originals in Holland. 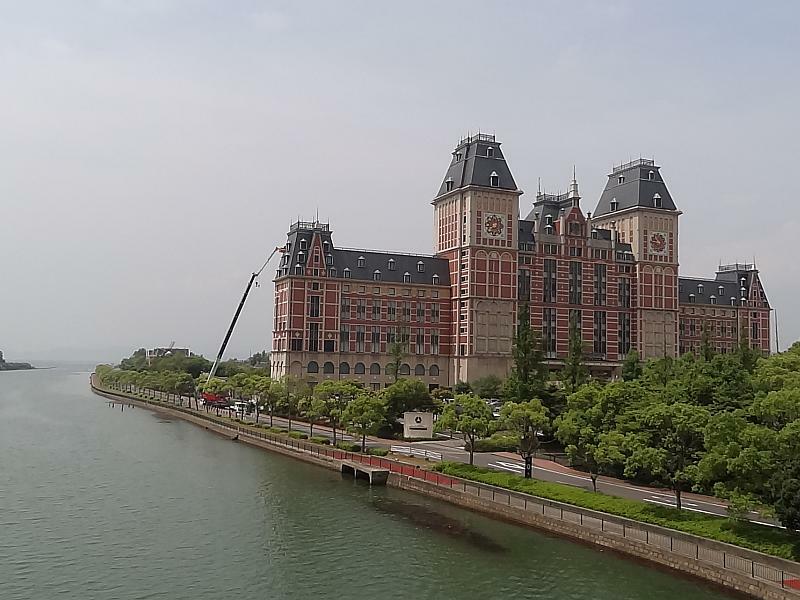 The Dutch were the only link with the outside world here for a long time during Japan’s period of isolation, hence their historical importance. Hotel at the a Dutch theme park of Huis ten Bosch. Continue south east on Route 34 without incident. Expected to ride uphill to the campground, 4km off Route 34 but when I do it is VERY STEEP! Over 300m in 4km! Pass a policeman on the way up who confirms I am on the correct road. I do it OK with a few rests and a lot of zig-zagging. At the camp ground the manager looked surprised to see me, I’m the only one there. The first time to use my new tent. 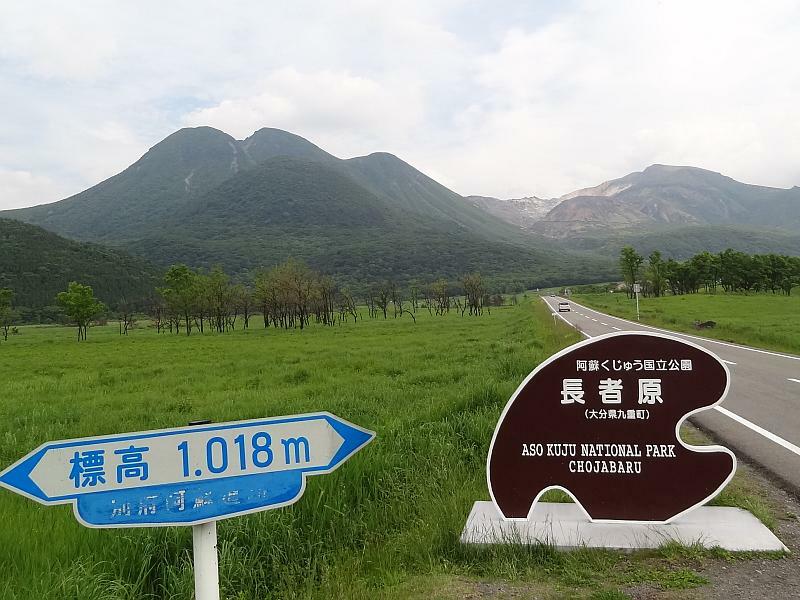 It is OK.
Saturday 2nd June – Nodake to Kumamoto. Leave before 9:00am and office opening. Fun ride down, take a different route in the hope of getting more distance before hitting the bottom. It works, around 8km with hardly a pedal. A good start to the day. Gentle rain starts at lunchtime at Isahaya so prepare for a downpour but nothing much falls. Clears later. Skirt round the base of Mt Unzen on Route 251. This is easier and more pleasant than the agricultural road higher up that I used last year. Make the ferry in good time. While waiting someone offers me money which I refuse to take. Later realise it probably wasn’t for me but Tohoku survivors. Now I hope I wasn’t rude in refusing to take it. But I am popular! A teacher from a school party brings a boy over who gives me a sheet of paper with Japanese writing on it, which I accept this time. I will have to get it translated. 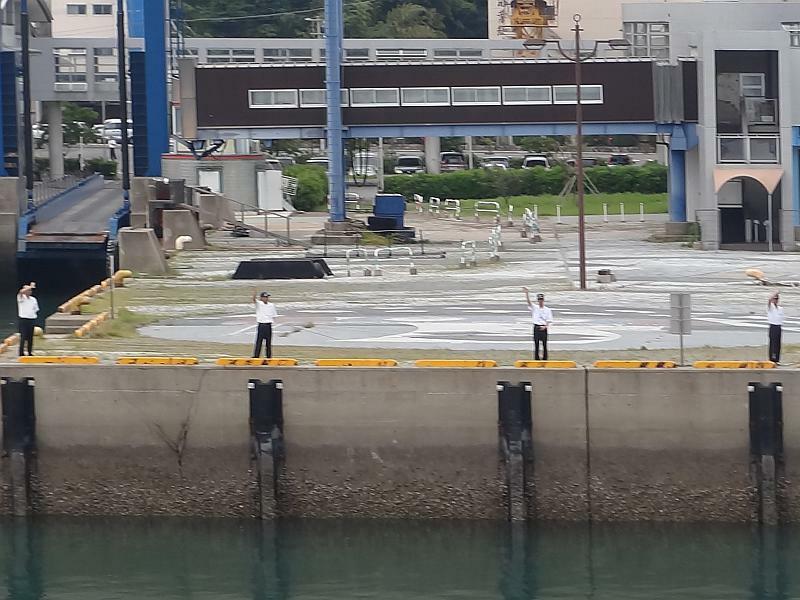 Staff wave good-bye to every departing ferry! Depart Shimabara on a different ferry company to last time. It is faster but cheaper! As a sign of their appreciation of being customers, staff wave good-bye to everyone departing on their ferries! At the destination port, the deckhand wants to hold me back while all the vehicles unload but I’m at the front and don’t want to wait, so push past him with his “careful, slippy” words following me down the ramp. 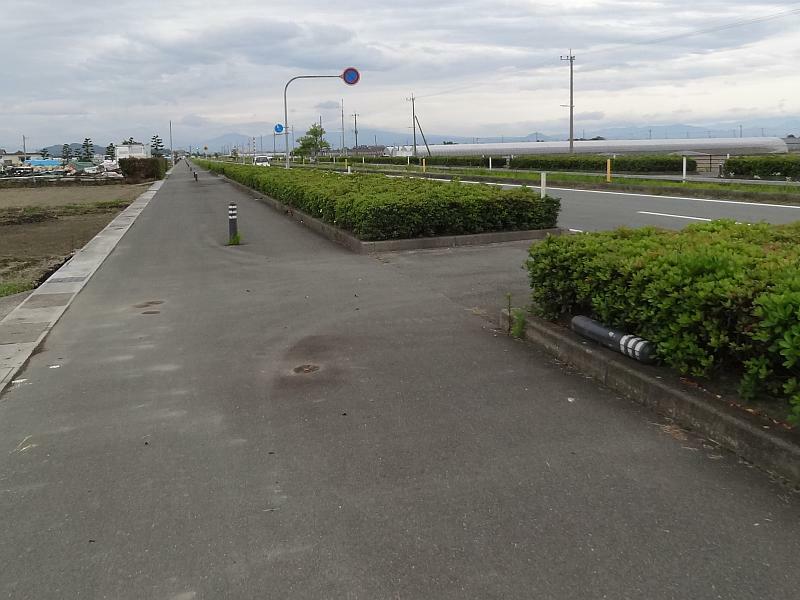 A lovely ride to Kumamoto along a wide cycle/walking path. 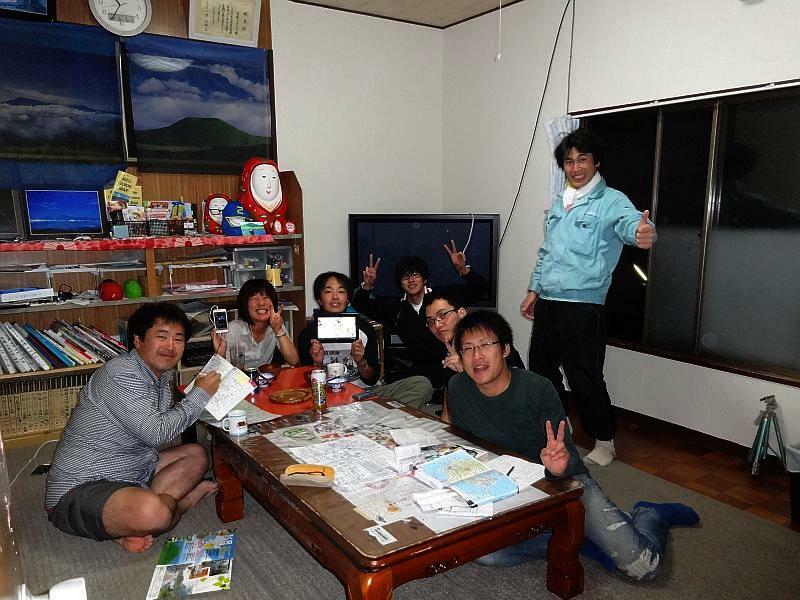 Arrive at Nakashimaya Guest House without needing to use a map this time, and before dark too! Another cycle tourer is there and share the room with him. He is heading south so we exchange information. During the night he snores loudly. 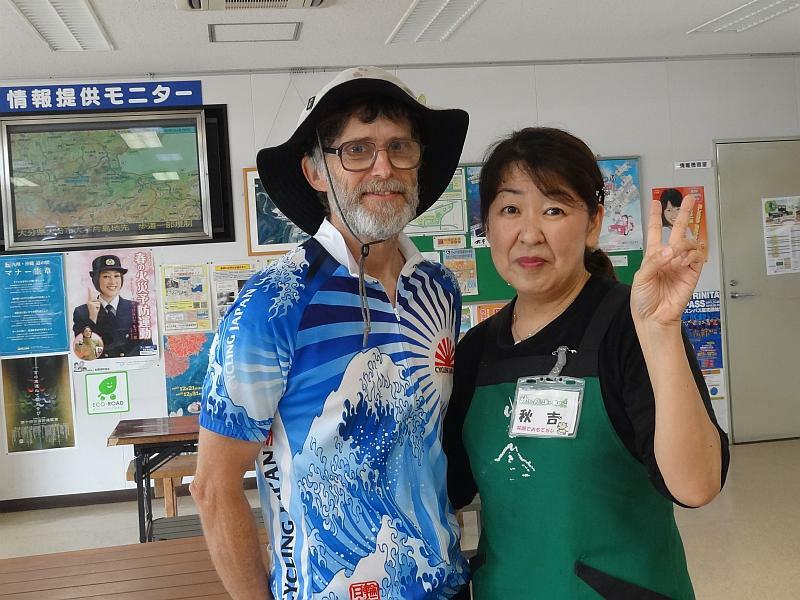 Another cyclist (and friend) at Nakashimaya Guest House. 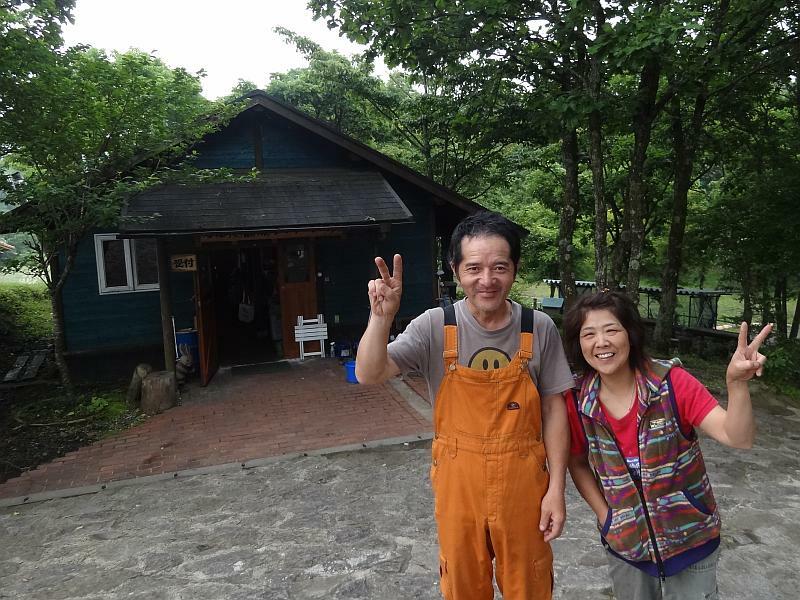 Sunday 3rd June – Kumamoto to Aso. 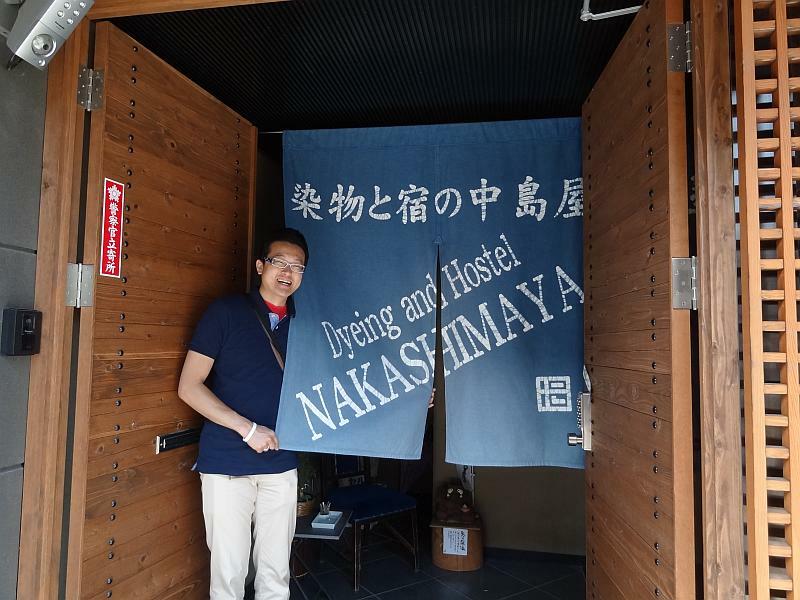 Nakashimaya Dyeing and Hostel itself is an impressive work of art! You can make your own work of art, learn how to dye materials using Roketsuzome or Shiborizome techniques, the former is similar to bakit in Indonesia…. See http://nakashimaya.ikidane.com for more information on the hostel and dyeing. 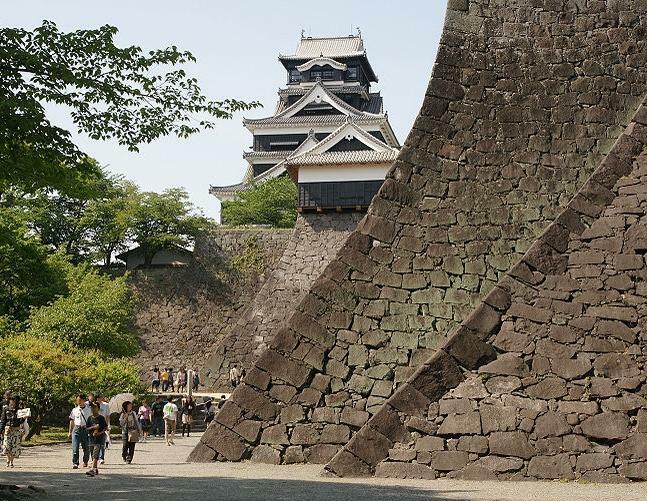 Pass the castle and buy a pair of gloves on the way out of the city to head up to Aso. The castle is said to be one of the best in the country. A bit late leaving but it is a short 50km. Hot and sunny. There’s a stiff climb for several kilometers up into the Aso caldera but manage to stop only once, makes me happy. Very busy road. Thought I would be late but arrive in good time. When I arrive at Aso Rider House no-one is home and door seems locked. Maybe Ban-san has gone away? Canot see any bags in any rooms. After an hour’s wait think about leaving to find somewhere at Aso-spa when some people arrive, come up the steps and open the door. I had tried to turn the handle the wrong way, it was unlocked all the time! Ban-san is away training to be a fireman but will be home later. Go for an onsen in the evening. I’m the only guest but friends come to visit Ban. Monday 4th June – Aso-san. Fine weather so go for a day trip up to Mt Aso-san. Arrive at the museum complex OK after another big climb. Have lunch and prepare to head over to the crater but don’t like the look of the clouds. Delay going a few minutes and sure enough they lower and rain starts to fall. I’m lightly clad so decide to head back down the mountain without waiting. Nice long downhill ride, keeping just ahead of the rain. It catches me just before arriving at Uchinomaki but by now it isn’t a problem. Ban-san takes us to see fireflies in the evening, very impressive. This is the second time in my life I have seen them, the last time being 35 years ago in South America. 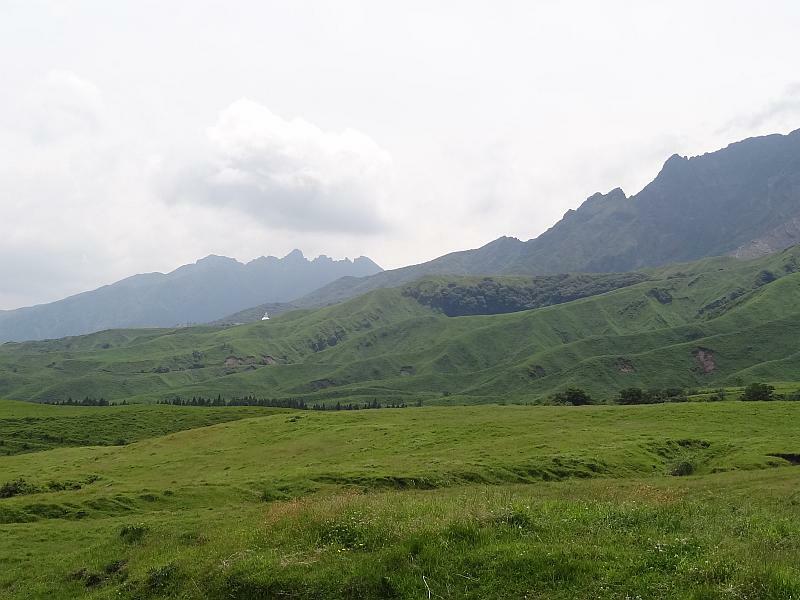 Tuesday 5th June – Aso. Rained most of the day, thought about leaving but with a 1300m pass to g oover decided against it. Bought a foam camping mat. A Korean cyclist arrives from the direction I was to go, he said it was terrible. Had to pay ¥1500 at an autocamp, without food and no shop. He went without evening meal and breakfast, had to endure heavy rain and wind coming here. He said I made a wise decision to stay. Ban-san took the others to see more fireflies but I decide not to go this time. 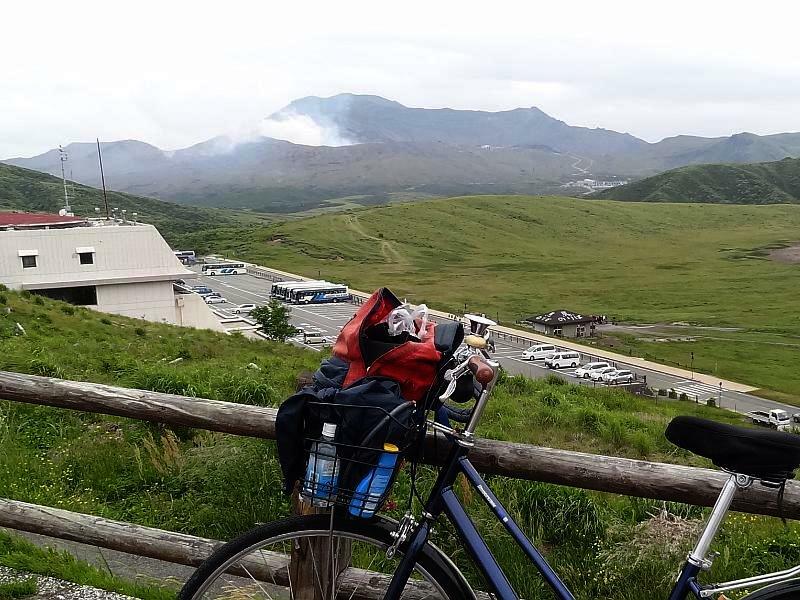 Wednesday 6th June – Aso to Handa. 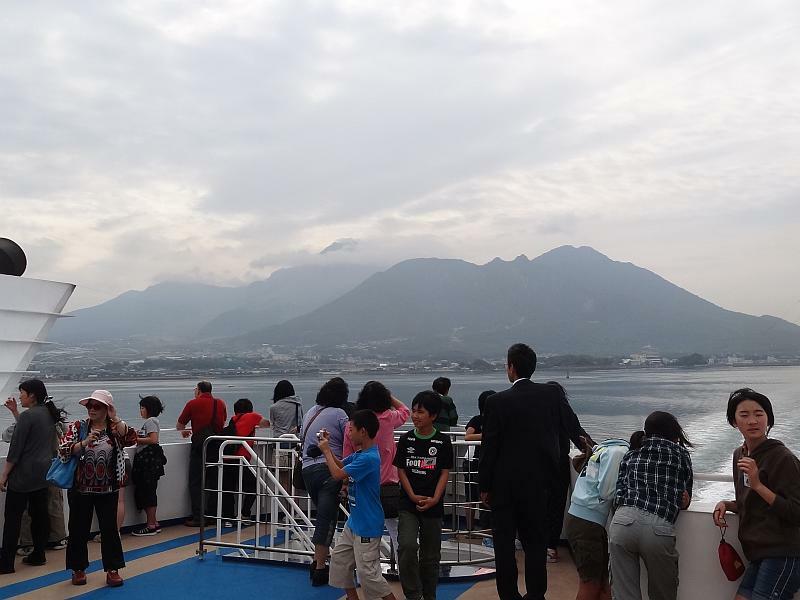 Ban-san had everyone up early to go see the fog, I don’t go as I saw it last year and want to depart early for Beppu. Don’t leave until after 9:00am but still I’m gone before they return. Climb to the lip of the crater without too much trouble, no falling into open drains this time! View of Aso-san from outer edge of the caldera, on the way to Beppu. Hard work though but happier now that I know I can do it. A 100km day might be possible in the right conditions. It sounds so easy when you write it! Come to the plant sculptures again. 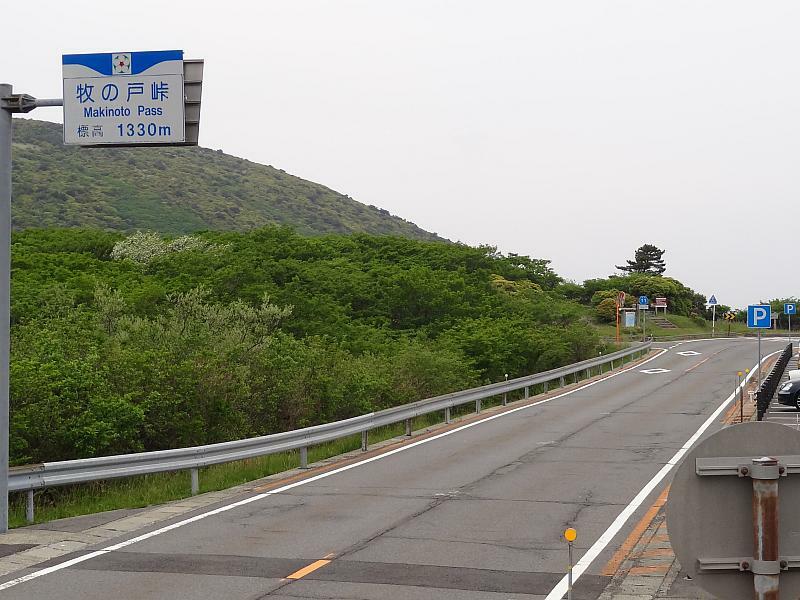 After the climb away from Aso, there follows another steep climb to Makinoto Pass! After the climb away from Aso, there’s a relative flat now and up bit, followed by a good steep climb to Makinoto Toge at 1330m. No wonder it is called Yamanamikaido – mountain wave highway! Many more people are at the pass this time compared to last year. Go for a walk to a higher lookout point. Then a long ride down to the next village (Chojabaru? ), where amazing views of Mt Kuju’s volcano are to be had. Have a nice chat with Taka and Yumi, a Japanese couple resident in Oz who are on a 2 year holiday in their campervan. Taka makes traditional Japanese paper screens. Not far to Handa, surprisingly no convenience store there, just a local produce shop that closes at 5:00pm. Find the rider house easily. Three guests stay in the four beds. It is basic but invited to sit in owners house for drinks and knibbles. The atmosphere reminds me of NZ and a lifestyle/wooffers farm. Interesting. One of the others snores loudly during the night, I clap my hands to wake him up. 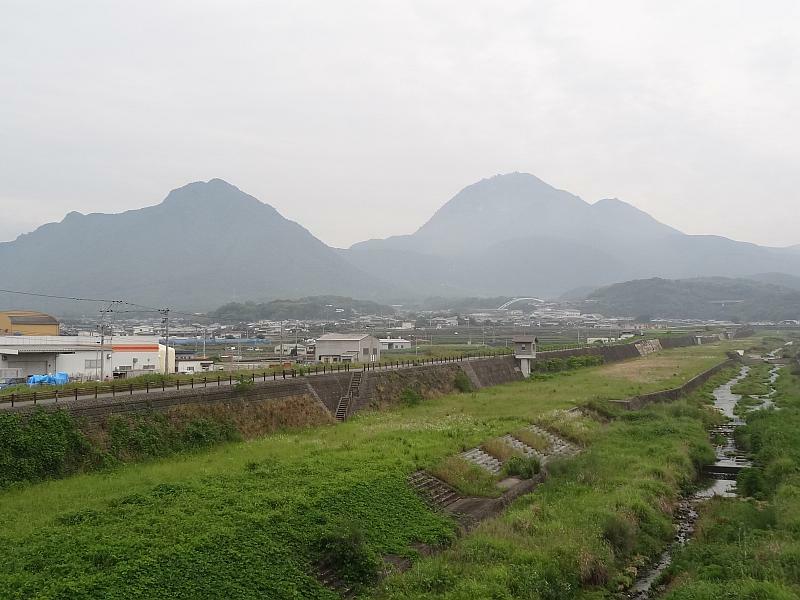 Thursday 7th June – Handa to Beppu. No rush to leave. 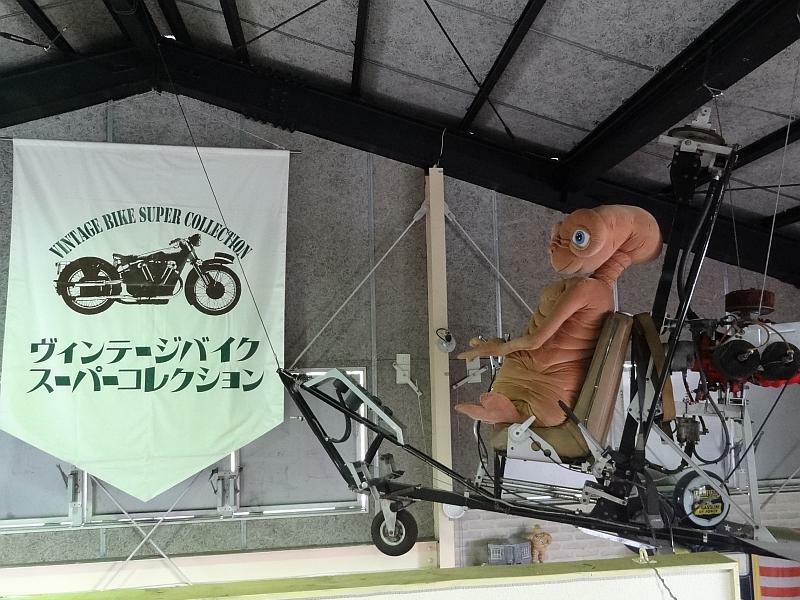 Arrive at Yufuin around 10:00am, get directions to the motor bike museum at the michi-no-eki. This year I arrive during open time. The museum is quite a place! There is a huge number of vintage motor bikes as well as other memorabilia. ET is one of the exhibits, I think it is the one used in the film. Curiosity satisfied, head over the hill on Prefecture Road 11 again. This road caught me out last year. It is a harder climb than I remember. This is the last uphill of the route before a nice 20km descent. No nutters try to overtake me on outside bends this time. I don’t ride over raised centre lines in the dark this time. Arrive at Beppu mid-afternoon without getting lost. Go straight to the JR station… almost, very different from last year. It is nice not to have to try read maps in the dark! Overhear some people outside Beppu Guest House laughing at the sign on my bike – “Crazy Kiwi on a mama-chari!”. Friday 8th June – Beppu. Raining and rained all day although the forecast said afternoon would clear. 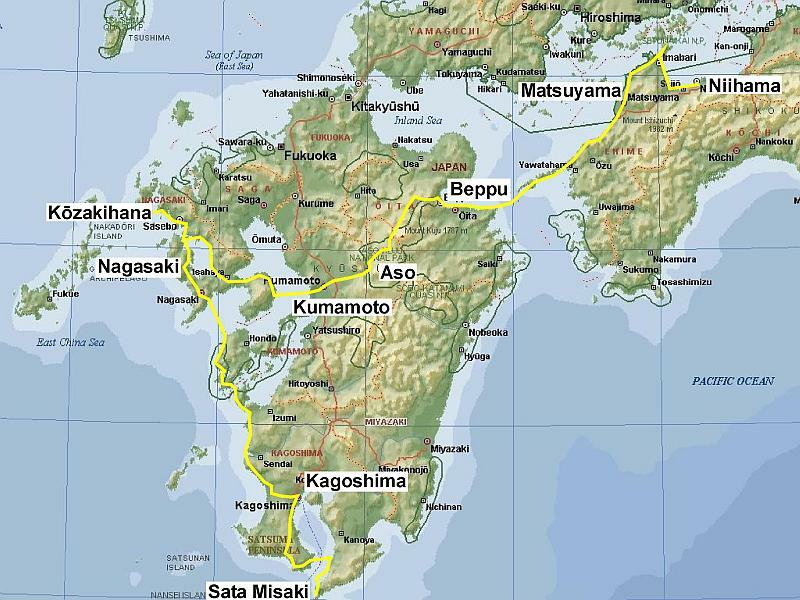 Changed mind about leaving, wanted to research the route after Matsuyama more, which I haven’t used before. May not be able to use internet for a while after here. Tried to repair mobile phone without success. Might be the end of it. 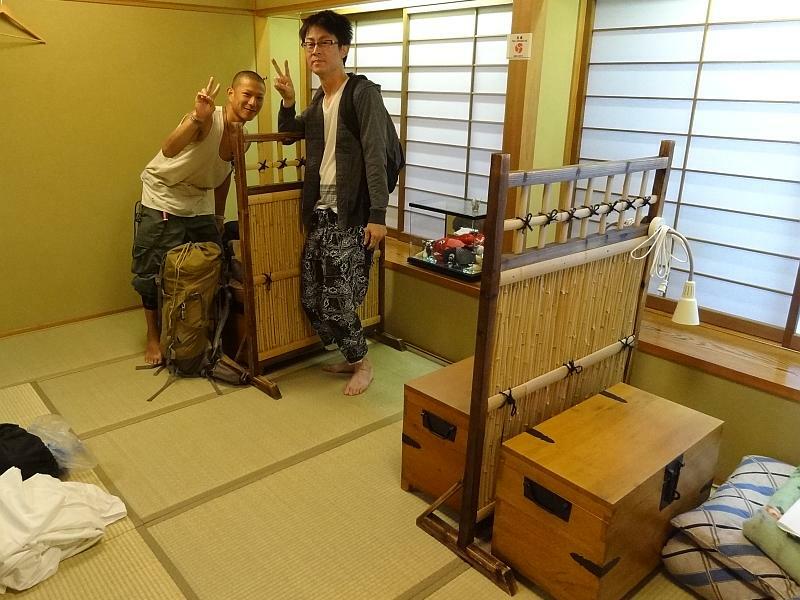 Have a nice chat to a Japanese guest and a German tourist staying at the guest house. Five Days until the Tsunami Second Anniversary.